I look forward to seeing everyone this upcoming show season. There are many new Bitti Bots in production so please stop by my Etsy shop to see my latest creations until the next show announcement. Some shows listed are still pending. Updates will follow as they occur. Thanks Cheri for your creativity, she's truly so adorable !! I love my new little dog! Thank you for creating him. Accountant by day, Tinkerer by night! I love robots and I love recycling so I found a way to combine the two. I've always been crafty, thanks to having a father who is a master "Jack of all trades". I've always loved the old vintage advertising and novelty tins as the graphics of the old days were so beautiful. When I see scrap parts and metal debris I don't see it as garbage, rather I see eyes, arms, legs or embellishments. I started making robots when my youngest daughter had to create a sculpture made from 100 found objects for a school project. We climbed in our golf cart and set out to find 100 found objects. The street of Miramar were loaded with lugnuts, Altoid tins, nuts, bolts, sparkplugs, etc. Surprisingly, we had 100 objects within an hour. I took 2 found Altoid tins, turned them in opposite directions, and a Devil Bot came to life. She got an "A" and I've been making them ever since. I started out making them for friends and family. Then my family encouraged me to list them on Etsy. The rest is history and I've been participating in Art Festivals all over Florida. I love the Art shows as it puts me in the company of all the great talent out there. I've met so many fantastic artists in all types of art. I hope to be making robots for as long as my nimble hands and vision hold up. 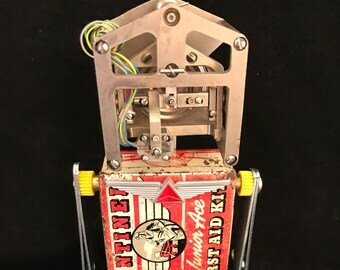 Accountant by day, tinkerer by night, I long to create these unique and fun robot sculptures using vintage tins and found, recycled or re-purposed objects. 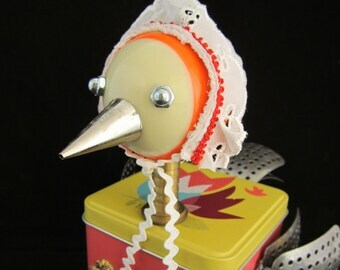 My bots appeal to all ages due to the unique and whimsical use of vintage and found objects.